My koi in June of 2001. Maggie is on the top (orange butterfly koi), and Colin is on the bottom (white butterfly koi). A shubunkin goldfish is on the right. The koi information is now on five different pages including this one. Keeping a pond devoted to koi is very different than a pond with only a few koi or devoted to other fish, animals, and/or plants. My pond is eclectic. It is not a true "koi pond" but contains two koi (soon to be four). For detailed information on setting up the high-tech, expensive, huge, specialty "koi pond," see the koi links page for entire large web sites devoted to these gargantuan beauties and created by experts in this area of pond keeping. See videos of my 1800 gallon pond which show the fish moving around, including my koi, Maggie and Colin. 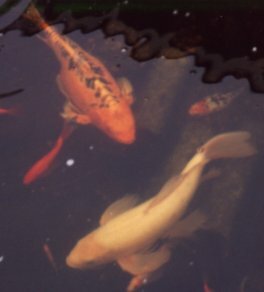 I have a page at Pond Showcase with photos of koi ponds (you are welcome to add your own too!). Return to the main fish page. See the master index for the fish pages.